Blatant self-promotion, but I can't resist. The book that I helped write is now in print. Find it here. Many thanks to my co-authors as well as the professionals at Cengage Learning for making this possible. While intended to accompany a college- or graduate-level marketing course, I think this text does a pretty good job of encapsulating the advice that can be found in other prominent trade books, in addition to presenting some original and innovative material (I'm especially proud of Chapter 3). 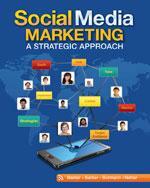 As far as I know, it's the most thorough treatment of social media marketing that can be found in one place. A boon to students and aspiring professionals alike. A magnum opus indeed. Hyperbole aside, I'm very pleased with how the book turned out. I hope that some other people are able to derive utility from it as well.